Vacation rental apartment. Sleeps 3, 1 bedroom, 1 bathroom. No pets allowed. Add $15/night if rollaway bed is needed. A rollaway bed is available for a third guest. Add $15/night. 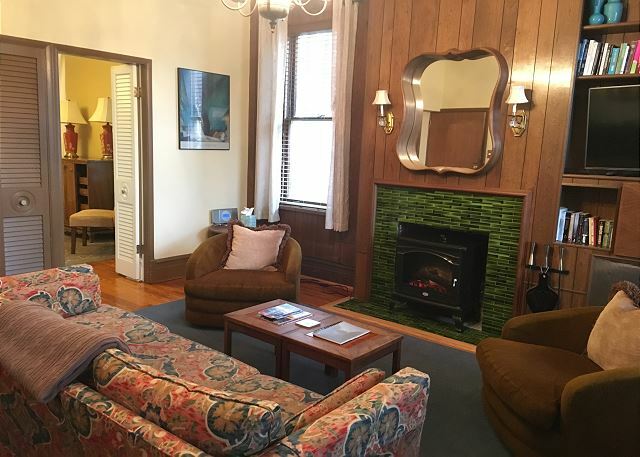 The Schreiber Suite is a beautifully furnished one-bedroom apartment in St. Louis' grand and historic Tower Grove East neighborhood, near Compton Heights. This apartment is a one-of-a-kind gem. The apartment features a King-sized bed of the highest quality. 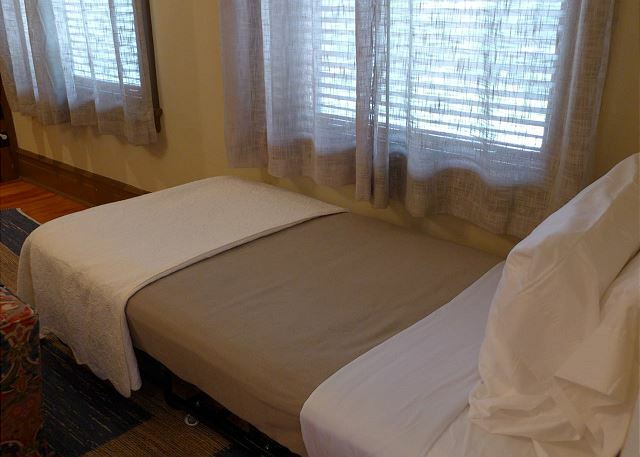 The Schreiber Suite sleeps up to three, with an excellent-quality rollaway available for a third person (add $15/night). Our pricing defaults to two guests sharing the King bed. 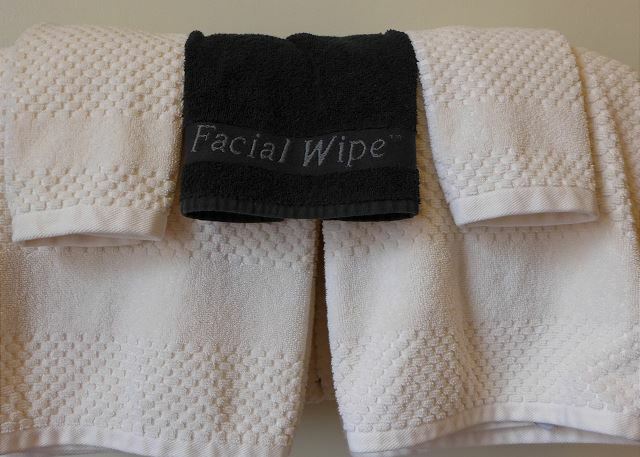 If you will have two in your party, but would still like to use the rollaway, please make your reservation for three. Included in the tariff is a rotating selection of light breakfast foods, welcome treats, a selection of teas, and freshly roasted coffee from one of the city's best roasters to start your stay. 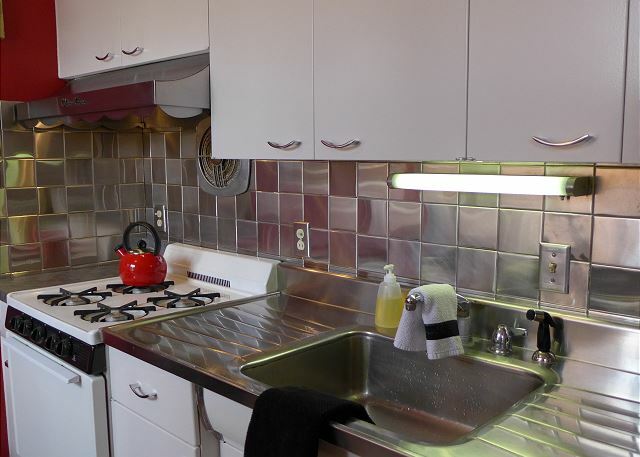 The streamlined kitchen is fully equipped, with a gas range, frost-free refrigerator, microwave, coffee maker, toaster, cookware and dishes. The apartment has WIFI, and an antenna for local stations on the flat screen television. You are welcome to log into any streaming services to which you subscribe, through the Roku Box. 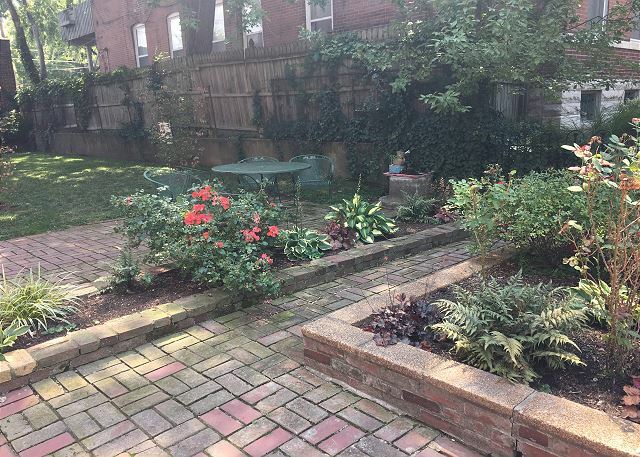 In warmer weather, sit outside and enjoy the garden in the Schreiber Suite's gated courtyard. Returning Guests always receive a discount! We use dynamic pricing to ensure competitive rates. Sorry, while we all love them, we do not allow pets at the Schreiber Suite. From this location it is easy to walk, bike or take public transit around St. Louis. The Gateway Arch, America's Center, and Downtown St. Louis are less than four miles from the Schreiber Suite. The world-renowned Missouri Botanical Garden is a delightful walk away, through some of the city's finest historic neighborhoods. St. Louis University Medical Center is within walking distance. The main campus of St. Louis University is two miles north. Washington University's main campus is about seven miles from the Schreiber Suite. 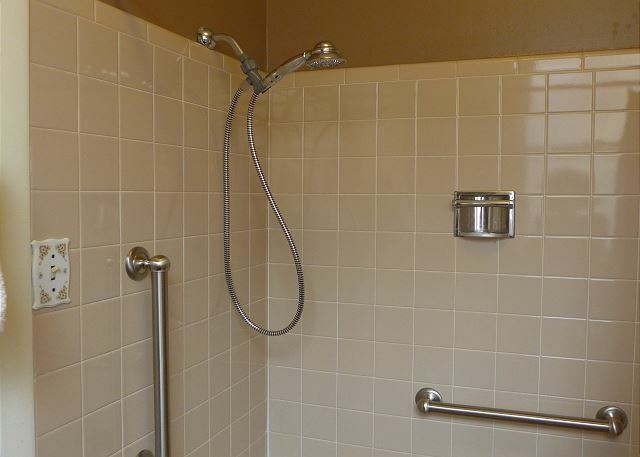 Barnes Hospital & Washington University Medical Center are four miles from the apartment. 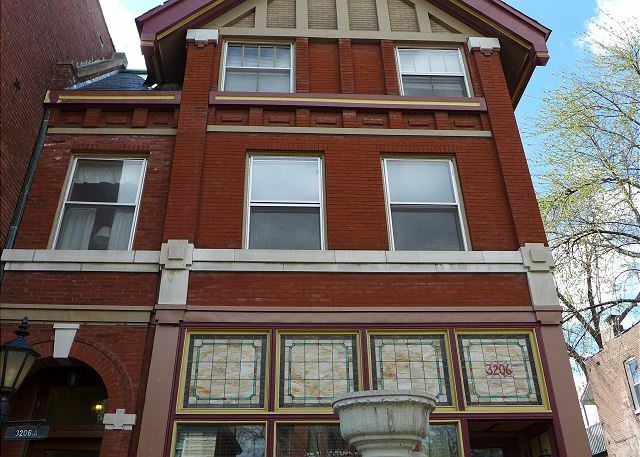 Numerous restaurants and magnificent historic parks are within walking distance. Parking is free and on-street in front of the Schreiber Suite. With the exception of those reserving over holidays or other high-demand dates, guests are not charged until their day of arrival. Two-night minimum required on weekends. Thank you for your interest! The place is exactly as described. The little extras help make us feel at home. We had the most pleasant stay in the Sheridan suite!! 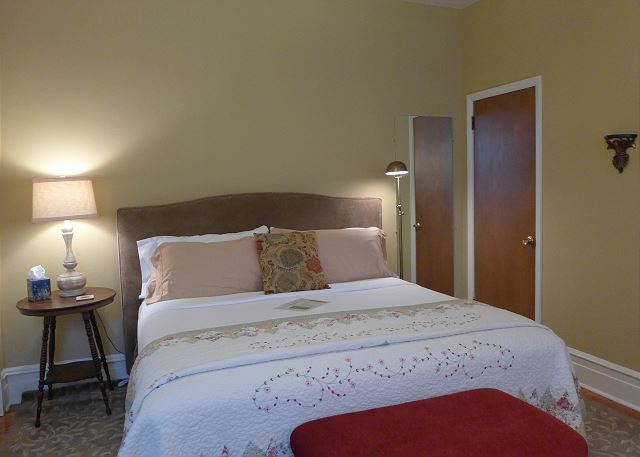 Very tastefully decorated- s caption all bed and bedding and very quiet. Our hosts were very helpful and responsive and we would most definitely stay here again!!! Everything was as expected or better, especially customer service when our plans changed the week before arrival. Loved the grocery starter-kit & treats. Furnished as advertised, safe neighborhood, only complaint is low furniture in the den is hard to get in/out of after a long day exploring. This apartment felt both roomy and comfy for two. There was enough space for me, the lazy one, to sleep in, while my husband, the early riser, could lounge around and sip coffee. Alert to coffee lovers: there is a great coffee spot just across the street on the very next block. And a fine bar/restaurant just next door. You don't have to get in your car (parking is free and easily available) to find a fun spot to refresh. We have stayed there twice now. The facilities are clean and comfortable. Great location for the price. Several little extras such as coffee, some breakfast items, and chocolates were really nice. 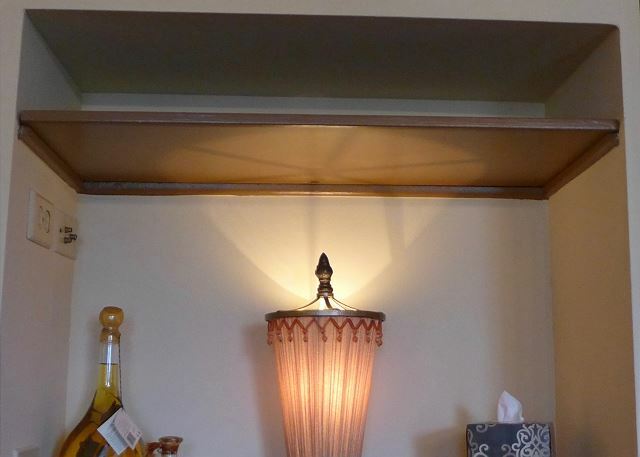 What a delight-- hit the sweet spot of renovated but retaining originalncharacter. So pleasing in decor choices. And lots of luttle extra touches-- great books on shelves including a marriage manual from the 1930's! Breakfast suppliesand treats. Superb location with a great coffee shop and two all-star restaurants right there. Easy to get to wuth well lit on street parking right in front. As a solo woman traveller I felt perfectly safe. The Schreiber Suite was perfect for what I needed. I was coming into STL to visit family, so wasn't spending a good deal of time in the suite itself, but it was cozy, clean and comfortable. I was also amazed at how quiet it was at night for sleeping. Thanks! 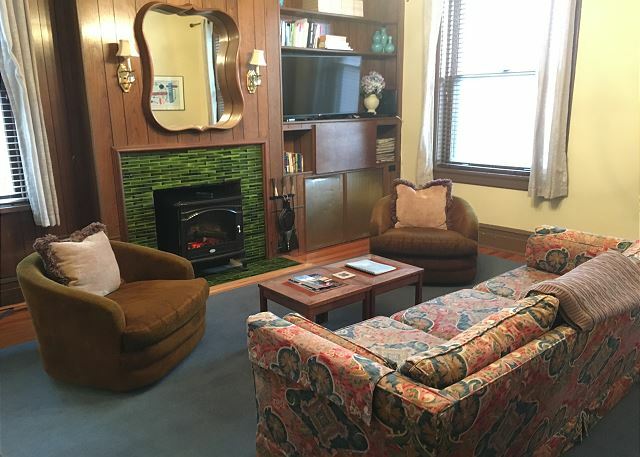 Was a great place — warm, vintage, cozy, comfortable, conveniently close to stuff, chock-full of breakfast food so could stay in for breakfast + spirits, and caring — let us back in when I locked myself out of everything! Excellent location, attention to comfort details, and value. Comfortable bed. Appreciated welcome goodies and breakfast stocked fridge. Management responsive to client requests. Loved coming into a beautiful, historic building instead of a sterile hotel after a day of touring St. Louis. LOVED our stay - from the neighborhood, to the location, to the privacy, to the look of the apartment! I wouldn't change a thing! This was our first Air BNB and I hope the ones in our future will live up to these standards! I think you may have spoiled us! If we ever go back, I will be staying w/ you again! Thank you! WE spent 4 days in this little gem. The location was very convenient, the neighborhood full of beautiful old architecture and diverse restaurants.The owners were lovely and provided breakfast items as well as dark chocolate-what a treat ! Exactly what we needed for the time we were here! Everything was great and the added touch of coffee and bagels was very nice! Definitely a five star AIRBNB rental! I wouldn't say it was in the "historic" heart of St. Louis, but near. 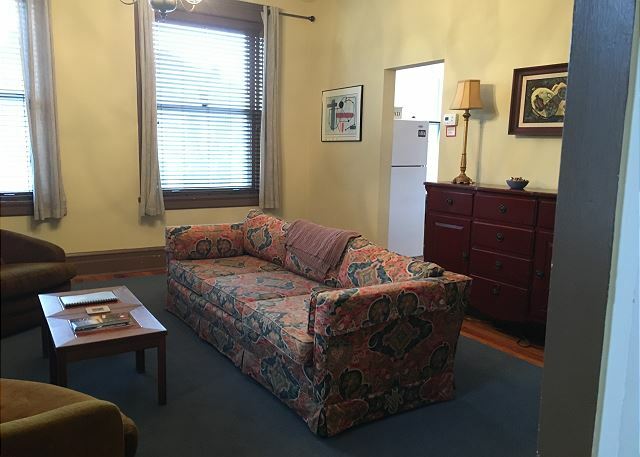 Clean apartment in neighborhood with character. Great ribs place around the corner. Would book again. Favorite home away from home in St Louis! This is the closest to perfect airbnb I have ever stayed in ! I am hard to please but this one did it for me . Mattress was a bit hard for my hips but my husband slept like a baby. These host go the extra mile - coffee, cold drinks, eggs, bagels ! Very nice extra touches all throughout ! Easy check in and great communication throughout! Will definitely return. Thank you so much! Top-notch everything!! We stayed over the weekend in Karen's apartment. Karen and her sister Rachel were very welcoming, helpful, advise giving etc. and since we had to take a red eye flight Karen let us even check-in at an earlier time. The apartment was very clean and the many "small things", like a bag of fresh coffee beans, apples, bagels and chocolate (my favorite, haha) ... made our stay even more enjoyable. There would be so much more positives to talk about but I just say this: "We would at any time stay at the Schreiber suite again!" This one bedroom apartment had the look and feel of comfort. The minute we walked in, we felt at home. The rooms were spacious and the owners had snacks, towels prepared, and everything you needed on a laminated sheet. The apartment is in a great neighborhood too. Only a couple of miles from downtown. If we ever travel from Ohio to the area, we will definitely be staying there. The rental was clean, safe and comfortable. This was our first time staying at an air b&b. The experience was excellent. We feel like we hit the jackpot with this one. This apartment is conveniently located and immaculate down to the detail. The communication with SF Shannon was impeccable. Stepping into the space felt like time travel. The rooms are restored to period beauty but feature the comforts of home. Every amenity was thoughtfully provided, including fruit, eggs, bagels and beverages of all types. 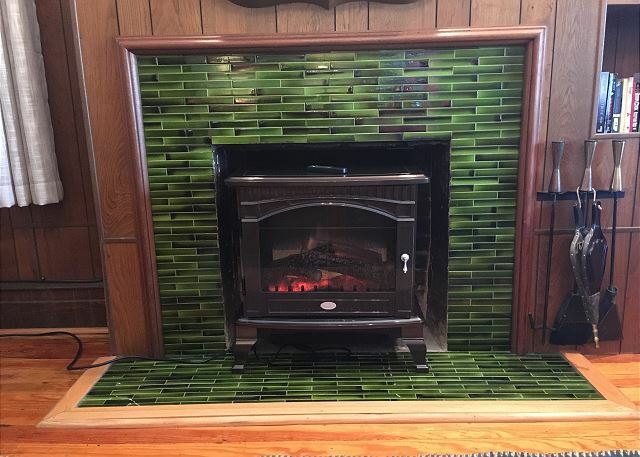 We are long-term VRBO fans and this rental ranks with the best of them! This was the third unit we stayed in owned by SF Shannon, every time has been perfect. 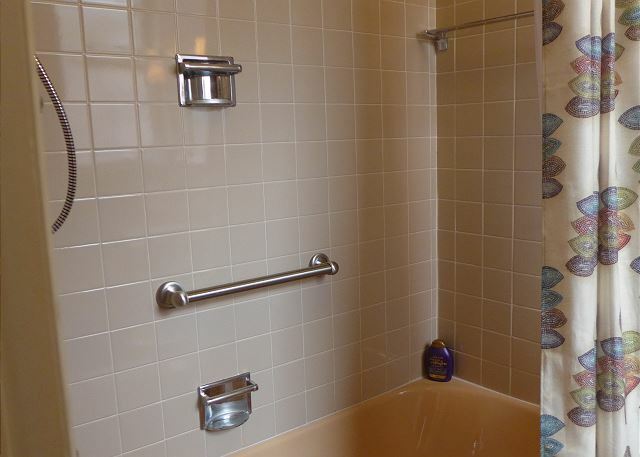 The apartments are very clean and have everything you need. We bring our dogs with and the units are very accommodating for the as well. I highly recommend their apartments. Thanks for a nice visit. With a previous 30 yrs of Hospitality under my belt I found this experience as good as it gets! Centrally located to nearby restaurants/parks & places of interest. Most importantly it felt like u were experiencing a piece of St Kouis History. Staff was amazing (Sue (hskp) & Anne (office). Stayed the weekend for a Cards game. Found the Schreiber to be very spacious , bed was very comfortable. Everything was clean and well organized. We have stayed at many of the S.F Shannon properties in the past and have always enjoyed our stay each time. Coffee in the morning was great also enjoyed the snacks that were provided. Neighborhood is safe and close to nearly all things St.Louis has to offer. Can't wait to come back this summer for our next trip! See you soon ! enjoyed our stay, with a nice restaurant next door and coffee shop a few steps away. Good location in interesting neighborhood. Owners left goodies to welcome us. Bedroom needs darker curtains for sleep. My daughter and I stayed here while attending a photography conference, unfortunately that left little time in the apartment. With that being said, sleep was what we needed and the bed here made that extremely easy! It was so comfortable! We also really appreciated the extras provided! We felt very safe and comfortable. Thank you for making this a fantastic place to stay! We will be back! This was a great mini escape for my wife and I. The apartment and amenities were wonderful. We especially enjoyed all the small touches...chocolates, snacks, drinks, etc. Great location! We were able to easily get around to the sites we planned on seeing. Loved the little coffee shop on the corner and restaurant next door! Will recommend your place to others...thank you! Excellent location. Nice accommodations, plenty of street parking, quiet building and neighborhood. Coffee, food, snacks and treats upon arrival! 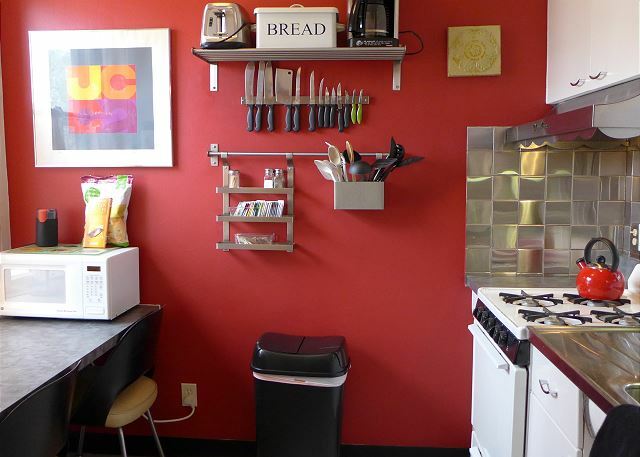 Nice little kitchen with plenty of dishes, utensils, etc. We were not able to get local TV reception but it was not a problem as we were rarely there. Enjoyed our stay and would return. This is our third stay with SF Shannon and we have no regrets! We have stayed in three different units....each have their own uniqueness....but have all been extremely clean, well thought out, and felt like our home away from home. It was like we were coming home! Easy to find, easy to park. They had breakfast and snack items in the fully stocked kitchen. The living space was super cute and functional. The king bed was comfortable and the bathroom had good water pressure (it's an old building). Very good communication from the owners. I would recommend and would stay again. 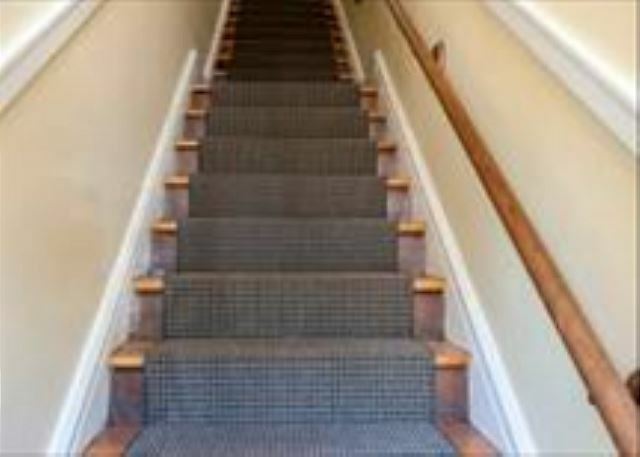 The only people I wouldn't recommend it for it people with limited mobility as there is a pretty big staircase to get to the unit. This was my third stay in one of these rentals and I will always come back. Ultra clean, support staff immediately respond and help, fantastic neighborhood, beautiful old building. Can't say enough! Bed was the best I ever slept on! Great experience all around. We enjoyed this new (to us) property and very much up to the standards of all of the others. 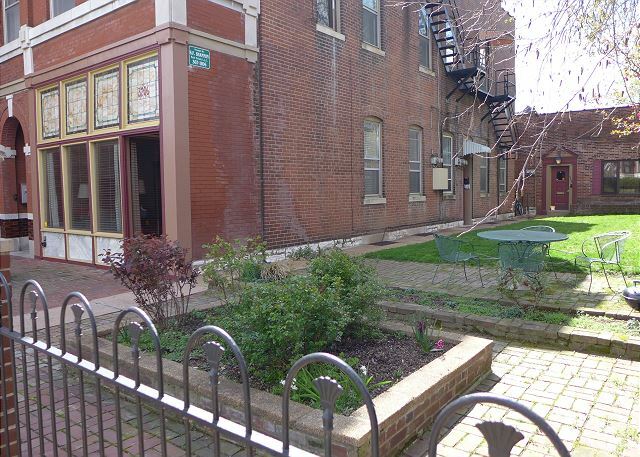 Very much enjoyed the neighborhood, Tower Grove Park, coffee shop, and convenient location. We'll be back soon. I stayed at the Shreiber suite with 3 of my graduate school women friends. The house was exceptionally clean, comfortable and well- stocked. We loved the location and frequented Crafted bar/restaurant as it was right downstairs. We walked to get ice cream at Ices about 1/2 mile away. It was petfect for our reunion. I am fro. St. Louis but felt like I was on vacation as it was a new neighborhood for me. I will recommend it to others. Enjoyed staying at the suite. Clean and neat. Enjoyed all the treats provided. Only complaint was den furniture was too old and needed to be replaced. Sofa was to low and too short and didn't provide adequate back support. Other than that stay was enjoyable. What a great experience at the Schreiber Suite! SF Shannon was very professional and great to deal with - their app was incrediibly efficient and helpful and they provided us with all the details we needed - from directions, check-in, provisions during our stay, and the check-out process. We appreciated all the little extras during our stay - well-stocked refrigerator and kitchen and comfortable furnishings. The bed was very comfortable and we had all the amenities we needed. We would definitely stay here again and will recommend it to all our family/friends. Thanks so much! 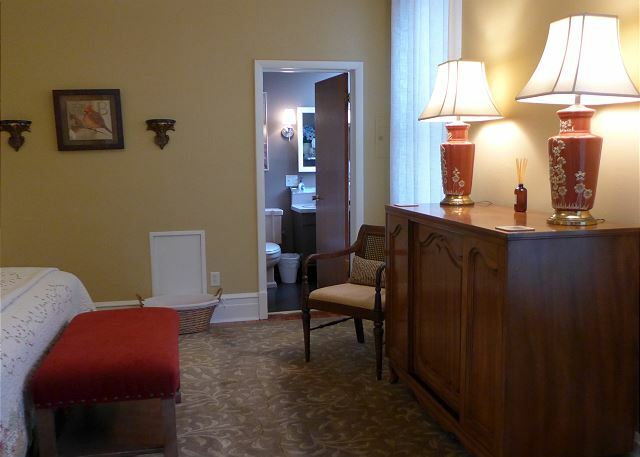 Clean and charming suite with all the amenities! The management was friendly and efficient from booking to checkout, which included providing a wonderful selection of snacks and beverages for our arrival. The suite was extremely clean, with provisions for our lab who joined us. The fenced-in yard was a nice haven for us to enjoy the quiet neighborhood. Will certainly return next time we're in St. Louis! We loved the Schreiber Suite. We always stay with SF Shannon on our yearly trips to St. Louis and have never been dissapointed in any location. Each place has it's own special charm and the locations have been excellent. Our ten years of experience with SF Shannon lets us know that there are no better places to stay in St. L. than those of SF Shannon. I have booked with SF Shannon and associates for my past 2 trips to St. Louis, and have been very pleased with my experiences. 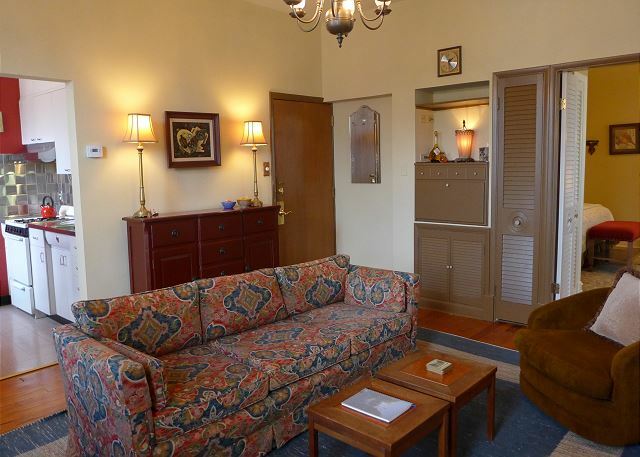 You will love this suite, and its location (near the highway and several local coffee shops, restaurants, and bars). We stayed in the Schreiber Suite in early July while visiting family in the area. 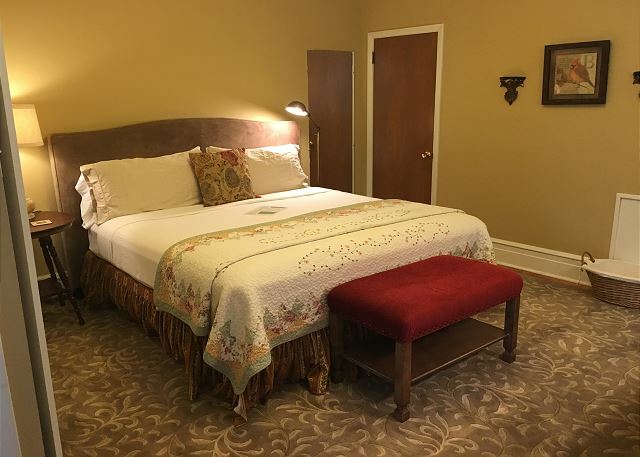 This was our first trip to St. Louis and the Schreiber Suite was just what we needed - clean, comfortable, great location and every one was so friendly leading up to and during our stay. My family actually occupied 3 different units during this time so we were all able to get the most out of our visit. Loved the little touches like beverages, fruit and bagels in the fridge, chocolate and coffee! Very happy with our stay and we hope to be back soon. Just the right space for our week in the city! The Schreiber Suite was exactly as pictured online. We appreciated the little touches of items provided and how wonderfully accommodating the ladies were. I would absolutely recommend this rental to others. The location made getting around easy to get around . The owners had special treats in the kitchen which were an added extra. Better than any hotel. The living room and bedroom were spacious. We hated to leave. We will be back! I started missing this flat the moment we left. It was a relaxing home base from which to explore St Louis on foot or by car. I especially enjoyed my early morning coffee and book while sitting at the kitchen table watching the neighborhood as it awakened. The flat was not only comfortable, but had real style with an eclectic mix of furniture and decor. 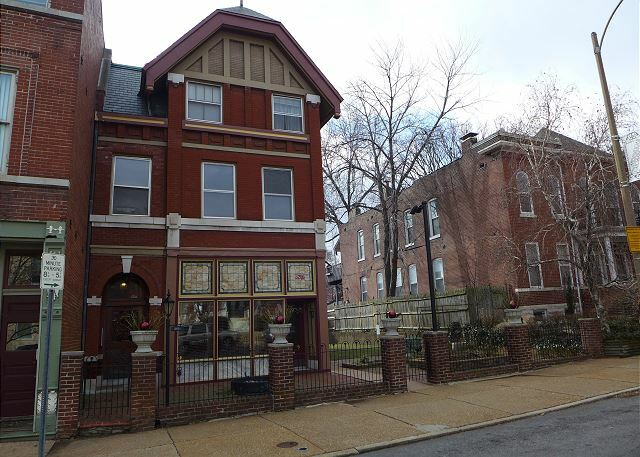 This was my first visit to St Louis and the flat gave us a real experience of one of its many wonderful neighborhoods. My wife and I stayed in St Louis for an extra few days after a work conference to explore and have some "downtime." We were thrilled with our choice to stay at the Schreiber! Our interactions with staff were spot-on - they are all delightful and helpful. 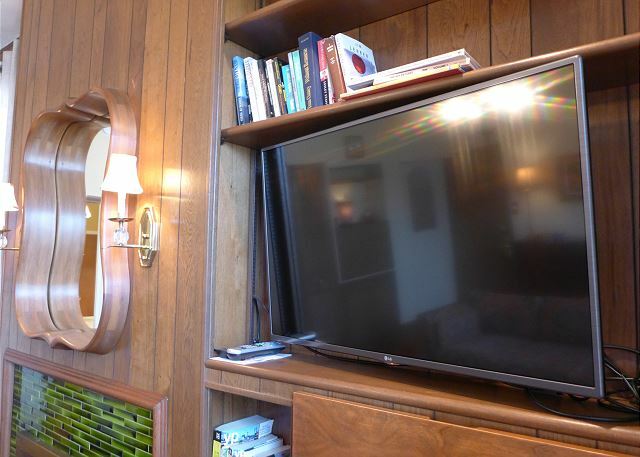 The Suite was spotless, and included so many "homey" touches from books to read to light breakfast items and coffee beans for my wife to grind for her morning coffee. 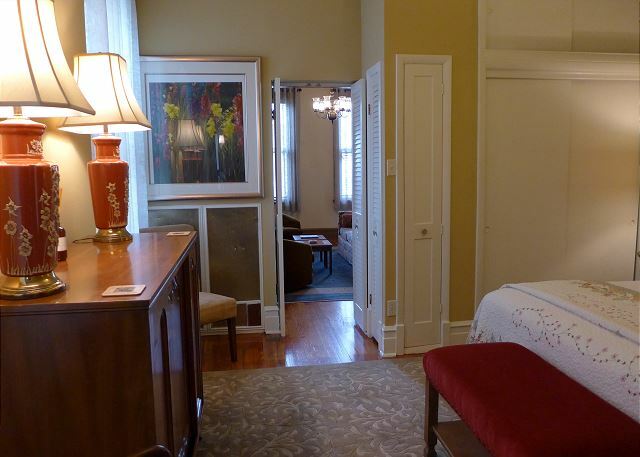 We would love to come back to St Louis, and Schreiber Suite will be where we stay when we do! My wife and I came to St. Louis to meet our very first grandchild. The Schreiber Suite was ideal and enhanced our visit. We enjoyed eggs and bagels each day for breakfast. The kitchen had absolutely everything we needed. The apartment was spacious and very clean. The bed was very comfortable. We strolled around the neighborhood every evening. It was a welcome retreat from a day spent with our granddaughter and her parents. 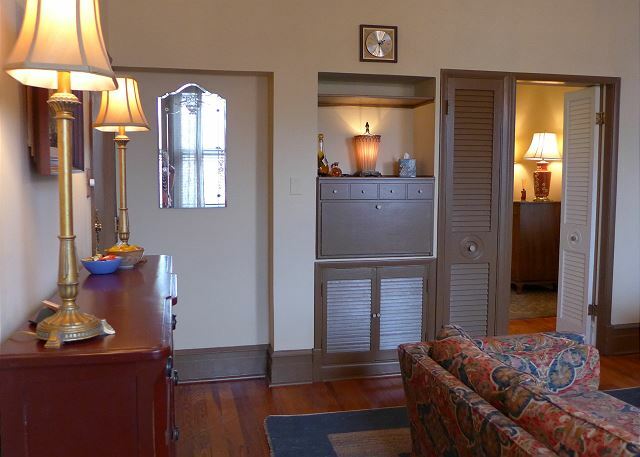 We will certainly stay at the Schreiber Suite every time we come to visit in St. Louis. Robin C from Arlington Hghts, IL (ILLINOIS) does not recommend this vacation rental. I stayed with my two small children this past weekend. While the place was clean, it is outdated but tasteful. Everything was clean and my son loved the fresh fruit available to him. Our main concern was that the stove in the kitchen wasn't working properly. The pilot light had blown out and the windows wouldn't open properly. So while we would have liked to use the kitchen, it wasn't possible. I did contact the company, and they fixed it within 3-4 hours. I am still uneasy with the idea that we endangered our children by using the oven. It defeated the purpose of our stay in an apartment. Otherwise, we were not there that much after that. It was an ok place to rest after being out all day. It was a pleasure having Robin and her family stay with us. We regret that the pilot light went out on the stove! But as she mentioned, we fixed the problem as soon as we saw her email. We are actually really thankful for this happening because we are installing a new automatic ignition stove in the Schreiber Suite this week to avoid future issues with pilot lights. Our guests always give us the best suggestions on improvements to our units. While we appreciate that mid-century furnishings may not be everyone's cup of tea, we hope this family will give our other apartments a try. 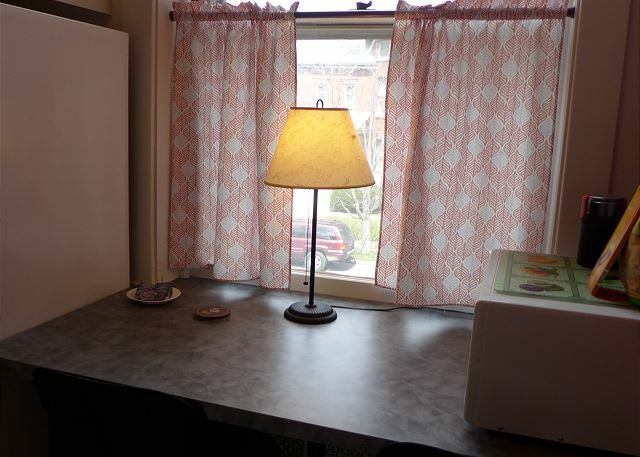 We always offer a Returning Guest discount, and we do have units with newer furnishings, though eclectic. For a complete list of our units (all located in historic buildings), please visit sfshannon "dot" com. Thanks! It was a pleasure having Robin and her family stay with us. We regret that the pilot light went out on the stove but as she mentioned, we fixed the problem as soon as she called. We are actually really thankful for this happening because we are installing a new, automatic ignite stove in the apartment this week to avoid future issues with pilot lights. Our guests always give us the best suggestions on improvements to our units. While we appreciate that mid-century furnishings may not be everyone's cup of tea, we do hope this family will give our other units a try. 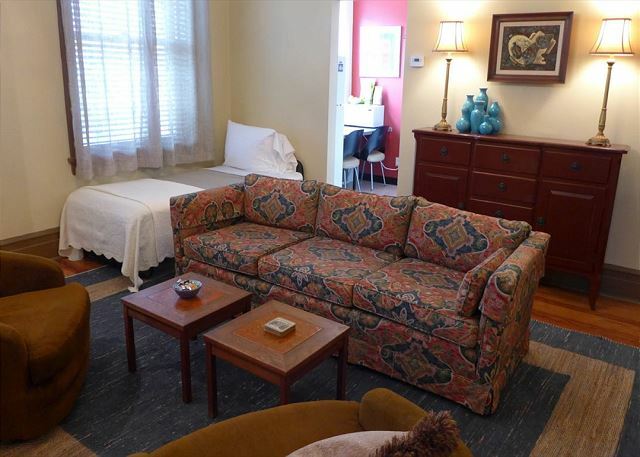 We always offer a Returning Guest discount and we do have units with newer furnishings though eclectic. 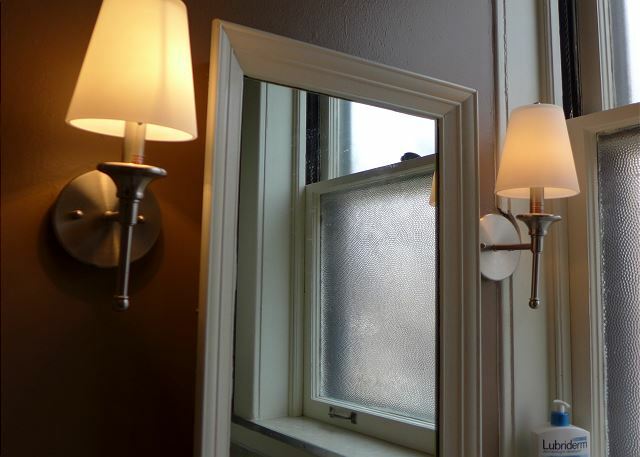 For a complete list of our units (all located in historic buildings), please visit sfshannon". "com Thanks! Great place to stay in St. Louis! We had a wonderful stay here for 2 weeks in December. 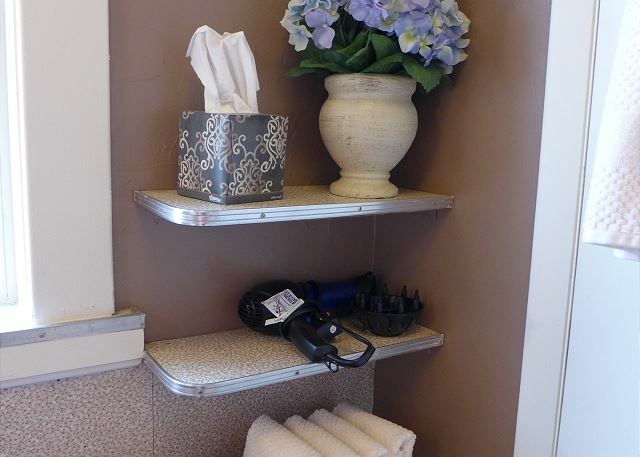 The owners have absolutely thought of everything from q-tips in the bathroom to candy in the candy jars. It is super clean. 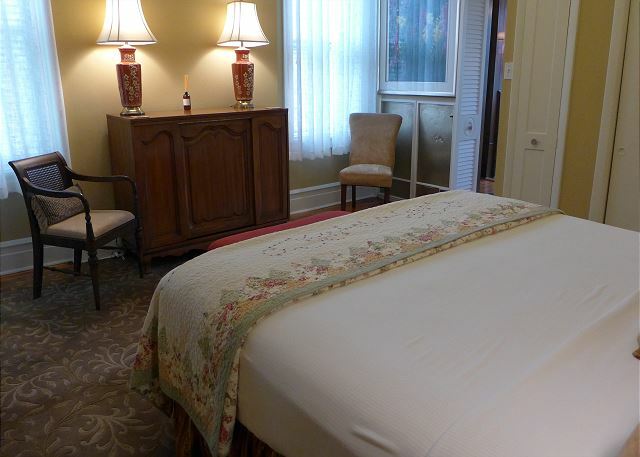 The beds are great with nice linens and towels. I almost hate to give it such a great review because we will be back often and just hope it is available! This was a fabulous find. The location was in a great neigborhood with bike lanes on many of the streets. The fridge was stocked with eggs, english muffins, fruit and beverages. There is a restaurant right on the corner that has outdoor dining and good food and drinks. The bed was supper comfortable. We would definitley stay again when we are in St. Louis. We stayed in the Schreiber Suite and it has such charm and warmth. We had plenty of space and it was great location and parking was at our front door. We had snacks and treats of all varieties left by Karen and Rachel. Bed was very comfortable and towels were luxury grade and all tolietries were provided....they thought of everything and then some. We loved it!!! A buddy of mine and i stayed at the Schreiber Suite during a long weekend in St.Louis; we played in a golf tournament but wanted to stay near to another buddy with whom we were playing and who lived about 1/2 mile away. The Schreiber Suite fit the bill. We were surprised by the niceties left for our use: candies, breakfast goods, and all of the equipment in a kitchen that included all of the major appliances. The a/c was a minor discomfort in two ways: 1) it was difficult to get the apartment as cool as we would have liked (the thermostat on the window units did not seem to recognize temperature changes) and 2) the living room a/c unit made disconcerting clicking noises all of the time. The linens supplied in the bath were extraordinary. 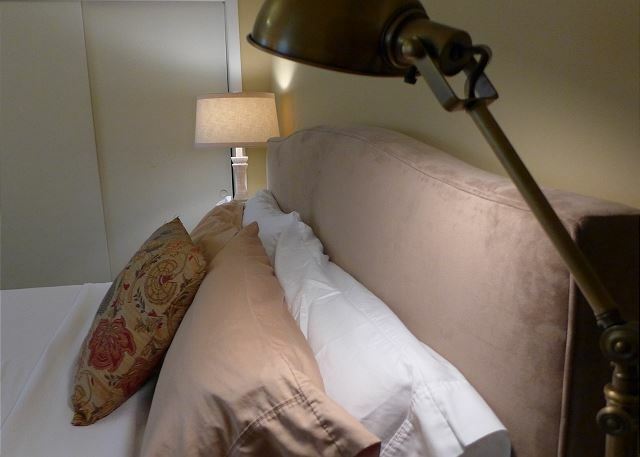 There were no linens supplied to enable sleeping on the , we made do by stripping the king bed of a pillow and coverlet from the bedroom. Thank you for letting us know about your issues with the air conditioning. We will make this right as soon as we can. Also, we have an excellent rollaway bed available, but did not know that you wanted it. When you make a reservation for two people, the computerized reservation system does not know that you'd like for the two guests to sleep in different beds (instead of sharing the King-sized bed). I hope we get the opportunity to host you in the future. If you'd like to use the rollaway bed, please reserve the apartment for three. Thank you so much! See my review of our stay at the adjacent apt., Anna's Retreat. This apt. Is just as nice and a bit larger. We enjoyed our stay at the Schreiber Suite. Rachel, as usual, was very friendly & helpful. The snacks & drinks that were stocked in the kitchen were very much appreciated. The bed was exceptionally comfortable and the whole apartment was nicely furnished and very clean. The only downside was that the A/C units were very loud. Luckily, it wasn't hot out, so we turned them off and the apartment was comfortable enough. Unfortunately, though, the unit in our bedroom dripped and the drip was loud enough to be very annoying. We turned it back on as it was better to have the constant sound of the A/C running, rather than the drip. Overall, we enjoyed our stay and would positively recommend the apartment.